Ngerende Island Lodge has been stylishly designed to provide the ideal safari experience where comfort, luxury and outstanding personal service combine naturally with the beautiful wilderness of the Masai Mara. The staff, food, quality of accommodation and many other smaller touches all come together to make it a lodge with a difference. The lodge provides guests with utmost privacy with the distance between each suite having been maximised to reduce any risk of disturbance which may be caused by other guests. 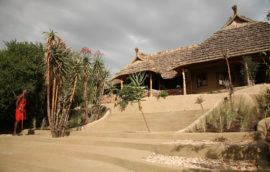 The staff here is also dedicated to making your stay at Ngerende fulfilling, enjoyable and exciting. Action packed day and night game drives in 4×4 vehicles, Bush meals, guided bush walks by lodge resident local Masai and sundowners are some of the activities to do here. Ngerende Island Lodge offers the best of luxury in the bush, gourmet dining, warm comfortable suites all with mahogany flooring, comfortable seating both in the suite and on the terrace, and outdoor bath or showers. Ngerende has seven luxury tents, all built on an elevated platform with a panoramic view over the Mara River and the woods. Each tent is very spacious designed for open plan living with a sleeping area, complete with fireplace and a separate bathroom that has a sink, flush toilet and both a shower and an outdoor bath. The living rooms have comfortable beds, desks, seating and plenty of closet space. 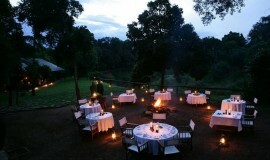 The main lodge has a dining room that extends onto the verandah overlooking the Mara River and the nearby hippo pool. There is even a honeymoon suite which is isolated from the main lodge to provide extra privacy, having its own private plunge pool and Jacuzzi. Ngerende Island Lodge also has a lovely infinity swimming pool overlooking one of the largest hippo pools in Northern Mara, and a spa offering therapeutic treatments. For business and corporate guests, the lodge caters for boardroom meetings, team building events, office parties or launching of a new product. Ngerende Island Lodge has identified stunning outdoor locations; ideal venues for private affairs, receptions, parties, photo shoots, press events or sales presentations. 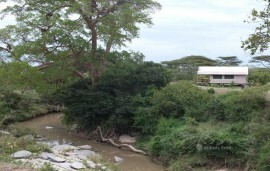 These locations are also ideal for outdoor dinners, and cocktails for up to 14 people featuring the warm African hospitality overlooking the Mara River. With the conference package, guests are provided with tea, coffee, snacks, mineral water, complimentary use of an LCD projector and screen, flip charts, note pads and pens. 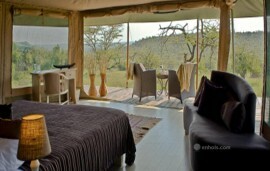 The lodge also provides the perfect location for weddings inspired by the natural wilderness. Corporate guests are guaranteed of privacy in a superb environment and along with the conferencing can get to enjoy afternoon and night game drives.